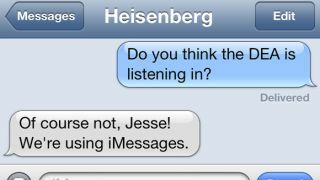 Blue ice meth isn't the only problem for the U.S. Drug Enforcement Agency, as Apple's blue iMessages service is the latest concoction that's thwarting the law enforcement agency's ability to spy on suspected drug dealers. The DEA warned that with iMessages' encryption, "it is impossible to intercept iMessages between two Apple devices," according to an internal document seen by CNET. "The DEA San Jose Resident Office learned that text messages sent via iMessages between Apple products are not captured by pen register, trap and trace devices, or Title III interceptions." This eavesdrop-block happens even if the DEA has obtained a court-ordered warrant by a federal judge and regardless of the carrier. Apple boldly claimed to provide "a secure end-to-end encryption" when it launched iMessage in 2011, according CNET, and it's living up to that promise. However, situations like this have become a concern for top U.S. officials, including FBI Director Robert Mueller. "There is a growing and dangerous gap between law enforcement's legal authority to conduct electronic surveillance, and its actual ability to conduct such surveillance," said Mueller to a U.S. House of Representatives committee two weeks ago. "We must ensure that the laws by which we operate and which provide protection to individual privacy rights keep pace with new threats and new technology." The FBI memo could be a ruse to trick drug dealers into thinking that Apple's prevalent iMessages service is more secure than it really is, theorizes the Cato Institute's Julian Sanchez. He comes to this out-of-the-box conclusion in part because Apple's iCloud service still holds the keys to unlock iMessaging data for law enforcement, even if the device is locked-up. "Messages may not be interceptable from a suspect's cell carrier, but Apple has to be capable of handing them over when the authorities come knocking with a warrant," he said in a comment picked up by Forbes. "All Apple has to do is provide the cops with an appropriate authentication token and they should, in principle, be able to turn an ordinary iPhone into a de facto clone of the suspect's own device." Since that hasn't been proven to be true, at least according to law enforcement officials, Apple can continue to claim that iMessages is between you, your recipients, and not the DEA.